Some experts believe that a joint effort between the world's navies can effectively combat piracy in the Gulf of Guinea. Petty Officer 1st Class Darryl Wood, U.S. Navy - www.defense.gov. Public Domain. The word “pirate” often conjures up images of eyepatches, beards, and cutlasses. Piracy, the maritime robbery of seaborne vessels, seems like an outdated form of crime in today’s modern era, but in some countries, piracy has persisted and over the years become more sophisticated. 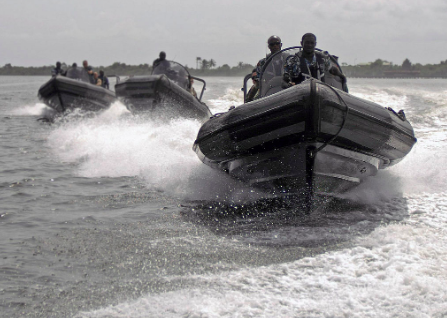 201 acts of piracy were recorded in 2018, an increase from the previous year, and this is due in large part to a recent surge in piracy off the coast of Nigeria. The country now ranks first in maritime piracy, with dozens of reported incidents of hijacking and kidnapping. Nigeria is one the world’s top ten producers of oil, and lies within the Gulf of Guinea, a coastal zone that lines West Africa. The economic surge brought on by the oil industry also brought a parasitic element in the form of maritime bandits. Ships en route to oil tankers are a favorite target of these pirates, who often plunder their cargos and kidnap crew members to hold for ransom. Over the years Nigeria's oil industry has been so successful, and its population growth so exponential, that the country now relies on imports for 70 percent of its commodities. A bureaucratic docking process can easily keep 50 or more cargo ships lined up offshore for weeks waiting to enter the port city of Lagos. These ships also fall prey to pirates, who use small skiffs to approach cargo ships and then, much like the pirates of old, board the vessels by means of a ladder or grappling hook. Pirates are often armed with automatic weapons, rocket launchers, and body armor when raiding ships. Even crew members who are not physically harmed often suffer psychological trauma in the wake of an attack. The International Maritime Bureau in Kuala Lumpur monitors pirate activity throughout the world. According to the Bureau, Nigerian pirates are extending their reach beyond territorial waters, and are targeting a wider variety of ships. Companies that operate in the Gulf of Guinea are trying to upgrade their surveillance equipment to combat the threat, but the process is time-consuming and expensive. For now, pirates remain an intrinsic part of the oil business in Nigeria. It is widely believed that only international action will be able to curb crimes committed at sea, and recently, members of the Baltic International Maritime Council (BIMCO) called on the US, China, and the European Union to form a joint Navel response to Nigerian piracy. The council believes that piracy is an international problem, and if left unchecked, could have economic consequences that stretch beyond West Africa. JONATHAN ROBINSON is an intern at CATALYST. He is a travel enthusiast always adding new people, places, experiences to his story. He hopes to use writing as a means to connect with others like himself.